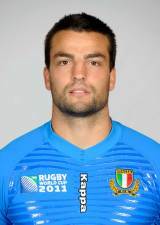 Fly-half Bocchino plies his trade for Aironi in the RaboDirect PRO12 having previously played for Rovigo. Bocchino pulled on the Italian jersey during the 2008 Junior World Championships. And he carried on his rise through the ranks appearing in the 2009 IRB Nations Cup with the Italy A side. Having made his debut for Italy against Ireland on February 6 2010, Bocchino failed to appear for the Italian side during the 2011 Six Nations tournament. But Bocchino was included in their 30-man squad for the World Cup.